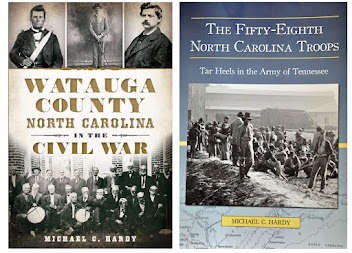 It has been a while since we looked at one of North Carolina’s counties and the war. So, I thought we would pick up and take a look at Davidson County, located in the Piedmont section of the state. 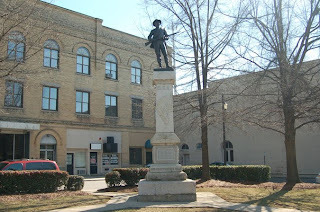 Davidson County was formed in 1822 from Rowan County and was named for William Lee Davidson, a patriot during the Revolutionary War who was killed at the battle of Cowan’s Ford, on the Catawba River, in 1781. The county seat is located in Lexington, named for the 1775 battle of Lexington at the start of the Revolution. The railroad arrived in Davidson County in 1855. Another principal town is Thomasville. In 1860, Davidson County had a total population of 16,601 people, including 3,076 slaves and 147 free people of color. In the 1860 presidential election, 1,186 men voted for Bell, 728 for Breckinridge, and 15 voted for Douglas. In the February 1861 vote on whether or not to call a convention to consider secession, Davidson County men voted 368 for and 1806 against the convention. Their elected delegates were Benton C. Douthitt and Benjamin A. Kittrell. Douthit was born in 1811 and served in the house of Commons in 1844 and the State Senate in 1858. He was a Unionist who switched when Lincoln called for troops. Kittrell was born in 1831, attended UNC, and studied law under Judge Pearson. He also opposed secession. 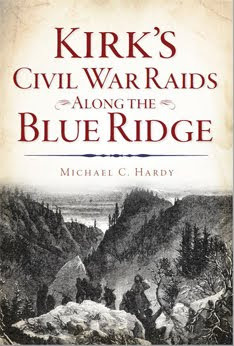 Davidson County sent nearly 2,000 men into Confederate service. 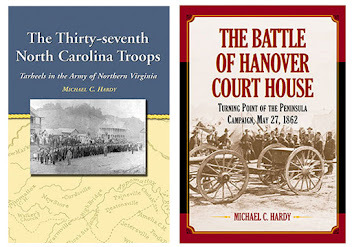 Some of those men served in Companies B and I, 14th North Carolina Troops; Company A, 21st North Carolina Troops; Companies A and I, 42nd North Carolina Troops; Company K, 45th North Carolina Troops; Companies B and H, 48th North Carolina Troops; and Company A, 54th North Carolina Troops. There are many interesting sites throughout the county. Several soldiers took advantage of the depot at Thomasville and left for the war from that point. A NC Civil War Trail Marker marks the site. Near Main Street and Salem Street in Thomasville is another marker. This one teaches us about a site nearby that was a hospital and a refugee camp. The hospital started out for Confederate soldiers, but later provided care for soldiers from both armies. Not far away is the Thomasville City Cemetery. There are 36 soldiers interred in the soldiers’ plot. Certain websites write that the Thomasville City Cemetery is the only cemetery in the world where Confederate and Union soldiers are buried together in a single gravesite. Thomasville was also the site of a shoe factory that helped supply Confederate soldiers during the war. In Lexington, the county courthouse was burned in February 1865 and General Kilpatrick stayed at the home of Dr. Holt at the close of the war. General Stoneman was stopped in a skirmish on April 12, 1865, at the Yadkin River bridge, and Jefferson Davis camped in a “pine grove” on April 16, 1865, as he sought to evade Federal troops. In September 1905, “Several thousand people from Davidson and surrounding counties gathered to witness” the unveiling of Davidson County’s Confederate monument. Among the throngs were an estimated 300 to 400 Confederate veterans. The monument was originally in the center square in front of the courthouse, and it was frequently hit by automobiles. In the 1950s the monument was relocated to a less dangerous place, not far from the original site. I was hoping to get some things posted before taking a small break for Thanksgiving, but alas, I’ve just not been able to get to anything. 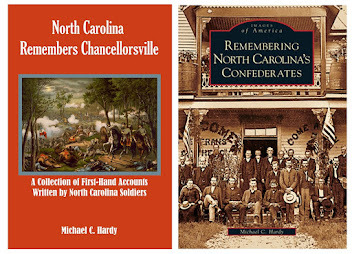 I’ve been putting together two notebooks on the Hardy and Glanton families for a family reunion we are having over Thanksgiving. No, these are not my North Carolina families. 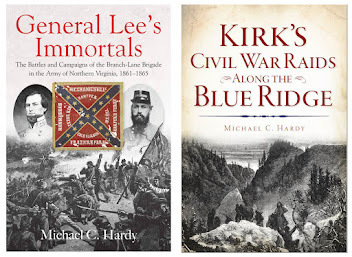 I did find a slew of ancestors in the 50th Alabama Infantry, along with the ancestors I already knew about in the 9th Alabama Cavalry, and 37th Alabama Infantry. I hope everyone has a good Thanksgiving break. We’ll see you on the flip side. Twenty-seven years ago this weekend, I went to my first re-enactment. It was held in Orange Springs, on the edge of the Ocala National Forest. I was ten. I don’t remember all of the details. Something in the back of my mind says that site was an actual skirmish site, or maybe the church there was the one that Capt. J. J. Dickinson attended. I don’t remember exactly. I do know this – I’ve been hooked since 1982. I’ve been to scores (hundreds?) of events, from the small to the great, and I’ve meet amazing people (including my darling wife). I would just like to say publicly – Uncle Jeff, my life would have been dull without you. I’m still not really working on much. I was in Asheville last night talking to their SCV Camp – good bunch of folks. I’ve been trying to answer email, and I’ve been slowly reading through some material and taking notes for my next project. I am kind of tired and burned out. Working 15+ hours days for about six weeks while I finished the 58th NCT book has taken its toll. So, I am just going to kind of glide for the next month or so. I’ve several appearances to make, and a family reunion to attend. So, blogging will be slow until after the holidays. Maybe I will get back to my county-by-county study soon. This past Sunday afternoon, I took a little ride here in Avery County. I was researching something and got distracted by a couple of cemeteries. One of them was the Fall Creek Baptist Church Cemetery, also known as the Fall Creek Graveyard. 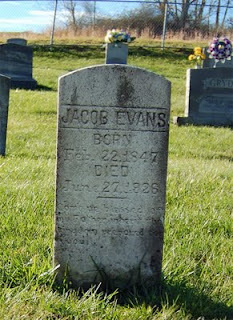 In this cemetery, I found the grave marker for Jacob Evans. There was a marker (one of the flat bronze type, stating that he had served in the United States Navy during the war. I did some digging this morning and found Evans in the Navy Survivor Certificates. He has an interesting story. Evans was born in 1847 in Surry County, North Carolina. In 1865, he was living in West Virginia and working on a steamboat. On March 1, 1865, he enlisted in the United States Navy in Cairo, Illinois. He served aboard the USS Nymph, Forest Rose, and Red Rover. He was in and out of the hospital while in service, for a variety of reasons, including diarrhea, lame foot, fever, cough, and influenza. Evans was issued a medical discharge September 1, 1865. Evans moved around quite a bit after the war. He was married for the first time in 1870 in Surry County. His first wife was dead by 1900. In 1906, Evans was living in Cranberry (then in Mitchell County). In 1909, he had relocated to Sullivan County, Tennessee. In 1911, Evans married Jane Greer in Elizabethton, Tennessee. They returned to Elk Park, now in Avery County, to live. In 1913, Evans was in the Soldiers Home in Washington County, Tennessee. Evans soon put in for a transfer and, in 1918, was in Montgomery County, Ohio, in another Soldiers Home. It is that year that he applied for and was granted a divorce, which was granted by a Montgomery County, Ohio, judge. The divorce was based upon the idea (fact) that Mrs. Evans was not fulfilling her responsibilities as a wife, even though it was Jacob Evans that left and removed himself several hundred miles away. When a month Mrs. Evans later was informed that she was no longer married, she wrote the pension office, stating that this was the first time she has heard of it, and that Jacob had abandoned her months beforehand and she had not heard from him. Of course, this is only part of the story. The rest is probably lost. In 1921, Jacob Evans returned to Johnson County, Tennessee, and in 1924, was back in Avery County. He required a nurse, who was Robert Church. Evans died at the home of Robert Church in 1926. Not much going on here in the western part of the Tar Heel State. We’ve had some beautiful weather the past week, but it is raining today (and tomorrow). For the first time in a long time, I am blogless– I really don’t have much going on. I’ve kind of been “on vacation” as of late. When I go “on vacation” I read broadly and spend a great deal of time outside. I had the chance on this past Saturday to participate in a living history here in Avery County for our local home school group. We worked with about 75 kids and parents (and a few people that just stopped by). We set up six different stations that the groups rotated through. These stations included: the war in the mountains, common soldiers, weapons, cooking, children’s lives, and care packages. We all had a great time, and were asked a lot of great questions. I absolutely love this type of hands-on programming. Tonight, I am participating in a Avery County and the Civil War program at the local library. I’ve been a part of this type of program for th epast three or four years in Yancey, Mitchell, Avery, Watauga, and Caldwell Counties. Basically, we sit around in a circle, and for two to three hours, talk about the war, both locally and nationally. While I facilitate the program, I am always learning something. 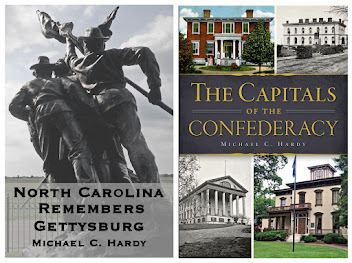 If your historical society, SCV camp, or UDC chapter would like to host this type of program, please drop me a note – I would love to help. The photo is our group of interpreters from this past Saturday. A lot going on this week, both in the news and with me (see previous entry). Here is what I found on my weekly crawl through the news. There is a new monument to Confederate soldiers in Weldon. Check out information regarding it and the war-time hospital in this article in the Salisbury Post. The Statesville Record and Landmark has an article about resources available at the Public Library in Statesville. Check it out here. Information regarding the skirmish at Deep Creek (Swain County), and effort to place a historical marker at the site, may be found here. The North Carolina Department of Cultural Resources has announced that advanced tickets are available for the 145th anniversary of the battle of Bentonville. Learn more here. There is some great information on Dr. Edward Warren, a North Carolina born doctor who wrote "An epitome of practical surgery, for field and hospital (1st Edition. Richmond, Va., West & Johnston, 1863)," one of the most widely used guides used during the war by Southerners. You can read more here. And, there is a new web site devoted to the life of Harriet Jacobs, put together by the Edenton-Chowan County Tourism Development Authority and developed with Historic Edenton State Historic Site. Check it out here. 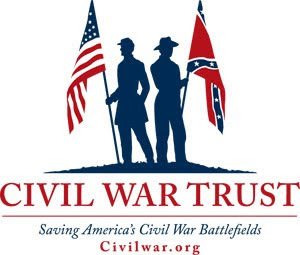 Lots of news – An article that I wrote a couple of years back (while researching the book on Hanover Court House) on Federal general Irvin McDowell is in the current issue of America’s Civil War. The new issue should be hitting newsstands right about now. 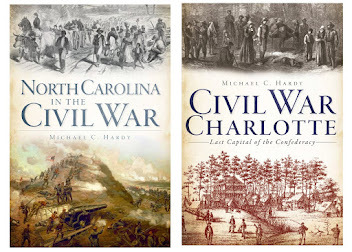 Also, I was recently interviewed for an article written by Sharyn McCrumb on Civil War re-enacting. The article is in the current issue of Blue Ridge Country. I saw one on a local newsstand on Saturday, and I encourage you to check it out. I will be on the road some this week. I am speaking tomorrow night (Tuesday) in Raleigh at the Barbecue Lodge at 4600 Capital Boulevard. Dinner is at 6:30 pm. I plan to do a little research in the archives beforehand. On Thursday evening I’ll be in Barnardsville at the Big Ivy Community Center. The meeting starts at 7:00 pm. 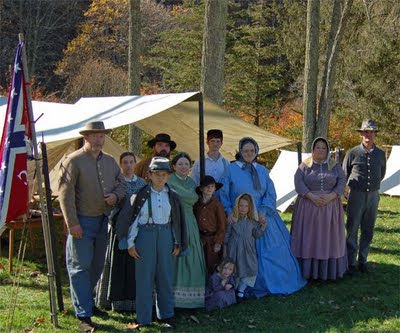 I’ll also be participating in a living history this weekend here in Avery County. This event is for our local home school group. I often comment that I try and take much of October off. I took a good deal of it off, but alas, October is over, and it is time to go back to work.